Early on Thursday the Kanker sirens blared awaking the sleeping citizens of the Culde-Sac. Many were caught off guard and began scrambling for cover. The JBC was caught right in the middle of a Kanker Invasion. Instead of running for cover we stood by and watched as Jonny's house fell. There was no time for interviews as we moved to a safer location to view the event. The Eds were no where to be found as Edd had built a secure shelter near the dump incase of an invasion. The Kankers continued to ravage the Culde-Sac destroying homes and causing massive panic among the citizens of Peach Creek. By three o' clock the debris was still falling on the houses of the Culde-Sac. Jimmy was able to make it to our location for protection. He stayed for awhile to give us a quote until another house fell behind us. " I was just minding my own business when the Kankers came out of no where. I was able to escape while they were occupied fighting with each other." Jimmy's house was lucky enough to still be standing after the Kankers hit it. Others weren't so lucky. Finally a day after the event the sirens turned off. The Kankers left behind a huge destruction of houses and property. After this event Edd has decided to make the shelter bigger and try to make the warning sirens go off earlier. So much destruction and chaos has never been seen in Peach Creek. But, will it happen again? Concerned by viewings of Ed, Edd, n Eddy, federal health officials recently swarmed Peach Creak hoping to discover the sanity of Ed, Edd, and Eddy. Armed with high government sponsored budgets and high quality inkblot tests, the officials soon found that their fears were a reality. 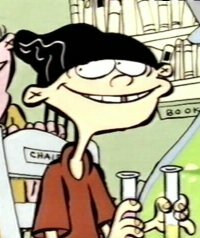 First to undergo the inkblot test was Edd. Before the test, Edd said, "Im confident that I will pass any test they can administer and put an end to these ridiculous claims." 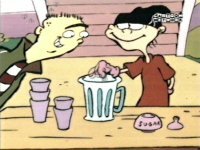 Unfortunately for Edd, the health officials ruled that while not insane at the moment, he could lose his mind sometime in the near future. Clearly distraught by this analysis, Edd promptly retreated to his room where he rambled mindlessly for 15 minutes before debating the meaning of life with his teddy bear. Undergoing the test next was Eddy. "Im sure Ill pass their tests", Eddy told JBC. "After all, I'm the one who comes up with all the plans around here." When reminded that all of his plans fell apart at one time or another, Eddy just stuck out his tongue, turned around, and walked toward the testing station. Five minutes after Eddy stepped into the testing area, a shout was heard followed by the sound of a high-powered elephant gun. When asked what all the commotion was about, one of the health officials responded, "Through use of our inkblot tests, Eddy was determined to be critically insane and a threat to the public health. We therefore found it necessary to subdue him before loading him into a paddy wagon that will take him to a government funded mental institute." When asked if he had any further comments, the official smiled and replied, "That little rascal put up quite a fight, but we got him in the end." Last to undergo the tests was Ed. When asked how he felt about the test, Ed responded, "I like gravy!" and walked into the testing area. Fifteen minutes later, Ed emerged from the testing area, accompanied by the remaining heath officials. Sure that this was the end for poor Ed, we were braced for the worst. When asked about poor Eds fate, the leading health official stated, "Ed is quite possibly the most sane individual we have ever seen. In fact, he answered every single one of the ink blots well within normal parameters." Genuinely surprised by Eds results, we quickly pulled him aside to ask him what he saw in the inkblot tests. 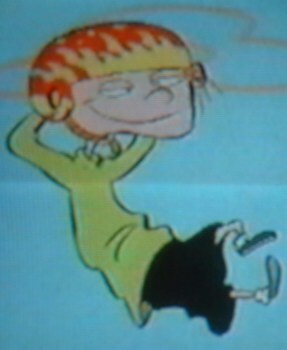 When asked, Ed replied, "Buttered toast silly." Armed with these results, it can only be concluded that either the government must really like buttered toast, or Ed has been hiding his real intelligence from us all along. 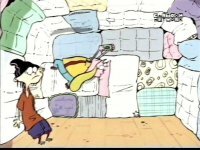 Regardless, we can only hope that Eddy will soon be able to leave his padded room and be able to venture back to Peach Creek and rejoin his friends. Emily: Hello Jonny, can I have a minute to interview you about plank? Emily: How long have you known each other? Jonny: Seems like we've known each other forever. I guess maybe 7 years. Emily: That's a long time; have you two ever split up temporarily? Like after a fight? Jonny: That has only happened once. That's when Plank said I cheated in checkers when I really didn't. Emily: How long were you away from each other? Jonny: About an afternoon. Jimmy took care of him which was nice of him but Plank said he was too weird. Emily: Yes, Jimmy does seem a bit odd at times. How did you meet plank? Jonny: His parents thought it was time for him to leave the forest. So he ended up traveling here. I remember seeing him on the playground when I got my head stuck in a tree. I don't have any brothers or sisters so I decided to take Plank into my family and treat him as my brother. Emily: Thats very nice of you; did you ever have any other friends as close as Plank? Jonny: No because Plank is the only one that really understands me. Emily: And I am guessing you are the only one that understands him? Jonny: No others understand him its not like he can't talk. Emily: Is he shy or something? Jonny: Sometimes but when he wants to speak he does. Emily: Can you give an example of when he might want to talk? Jonny: If he's in a good mood which he basically always is unless Eddy scams us. Emily: It always seems Plank turns the scam on them, how does he know exactly what they'll do? Jonny: Plank sees things. He knows by instinct what the Eds will do. He has been watching them since he was a sapling and knows all of their tricks. Emily: What are his opinions on the Ed's? 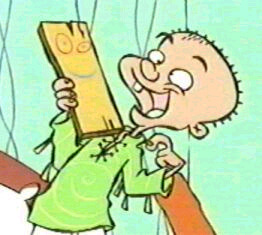 Jonny: Well Plank likes Ed a lot because Ed tries to communicate with him unlike the others. Ed also helps me like when I fell asleep on the sidewalk; Ed carried me around so the buzzards wouldn't get me. Emily: How do your parents react to Plank? Jonny: The think that it is good to have another son in the family. Jonny: Plank likes Edd because he is nice but he really doesn't like Eddy because of the pain that Eddy has tried to inflict on him. Emily: How do others in the neighborhood react to Plank? Jonny: They basically think he doesn't exist but he likes them all. Jonny: Can we go; me and Plank want to go diving for Clams. Emily: Ok, thank you for the interview Jonny. So that was my interview with Jonny. Its obvious that along with the Ed's, Jonny and Plank have the best friendship in the Culde-sac. As we all know Kevin is dangerously in-love with his bike. he has a great amount of tools in his garage and spends his allowance money on bike parts,tools, and other doo-hickeys. This summer Peach Creek will be having a biking contest, hes already training to become the champ. He just finnished making a new ramp for his bike. Jawbreaker Chronicle Dr. Eric P. had just reported that he had a severe fracture in his left leg and right arm from the new ramp he had built. Kevin was rushed to the hospital imeadiately. But that didnt stop kevin from getting ready for the big contest, he stood up and said "No dork is gonna stop me from being the best biker in Peach Creek". His injuries have slowed him down however, he still appears to be training. Despite the doctor's orders to stay in bed Kevin has been doing the opposite. How will this injury effect his biking? No one really knows, but you can be sure that he won't give up on his dream. Why, I must be doing something right because I'm on week two! Now, let' get to this week's question, shall we? Dear Edd: There is something I really want and I have enough money for but my parents want me to save it. What should I do? Well if you buy the thing you want now, then you'll have it, and you'll be happy. But if you save it, then you could buy something even better. If you want something more than this than save up if not go ahead and spend it. The Eds have announced that they're planning on starting a merchandising chain. This is probably the best idea that they have had so far. Many people like their show so they will buy their products. With already a game out for Gameboy Advanced the Eds are looking to include the following: shirts, hats, videos, action figures, comics, soft drinks, school supplies, toilet seats, sheets, and candy. This is a very long list which the Eds hope to start selling by next year. In the JBC's opinion this adventure will succeed. Come buy the new and improved Ed-O-Gee drinks! Only 25 cents and are promised to bring you all the energy you will need. "Need Energy? Grab yourself an Ed-O-Gee drink"